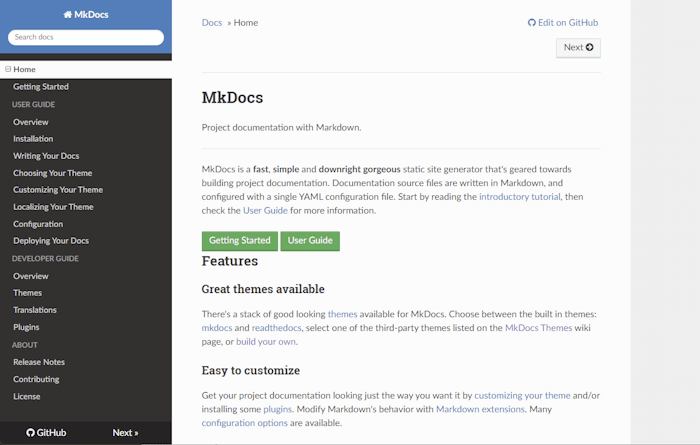 MkDocs builds completely static HTML sites that you can host on GitHub pages, Amazon S3, or anywhere else you choose. There's a stack of good looking themes available for MkDocs. Choose between the built in themes: mkdocs and readthedocs, select one of the 3rd party themes in the MkDocs wiki, or build your own. 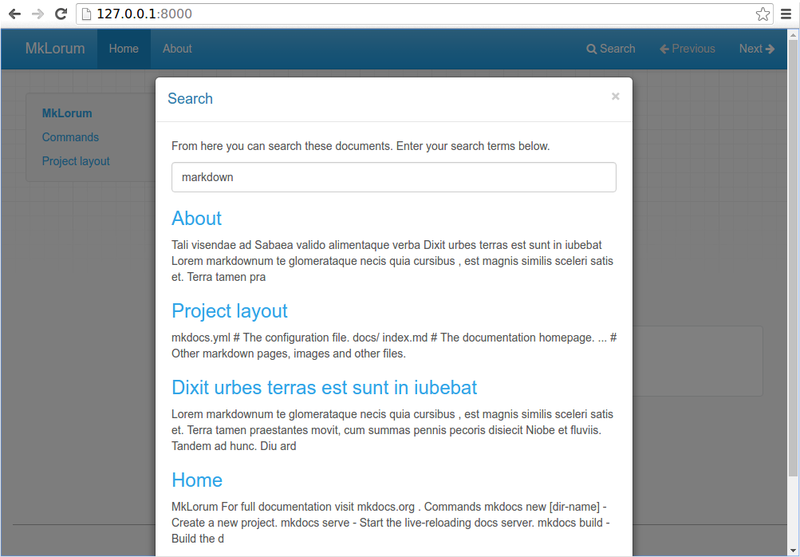 The built-in dev-server allows you to preview your documentation as you're writing it. It will even auto-reload and refresh your browser whenever you save your changes. If you have and use a package manager (such as apt-get, dnf, homebrew, yum, chocolatey, etc.) to install packages on your system, then you may want to search for a "MkDocs" package and, if a recent version is available, install it with your package manager (check your system's documentation for details). That's it, you're done! Skip down to Getting Started. If your package manager does not have a recent "MkDocs" package, you can still use your package manager to install "Python" and "pip". 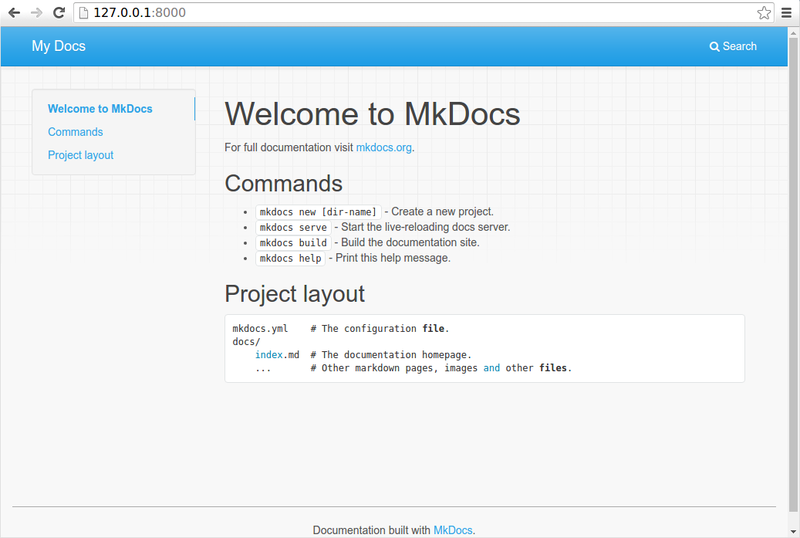 Then you can use pip to install MkDocs. MkDocs supports Python versions 2.7, 3.4, 3.5, 3.6, 3.7 and pypy. Install Python by downloading an installer appropriate for your system from python.org and running it. If you are installing Python on Windows, be sure to check the box to have Python added to your PATH if the installer offers such an option (it's normally off by default). See the click-man documentation for an explaination of why manpages are not automaticaly generated and installed by pip. If you are using Windows, some of the above commands may not work out-of-the-box. For a more permanent solution, you may need to edit your PATH environment variable to include the Scripts directory of your Python installation. Recent versions of Python include a script to do this for you. Navigate to your Python installation directory (for example C:\Python34\), open the Tools, then Scripts folder, and run the win_add2path.py file by double clicking on it. Alternatively, you can download the script and run it (python win_add2path.py). Take a moment to review the initial project that has been created for you. There's a single configuration file named mkdocs.yml, and a folder named docs that will contain your documentation source files. Right now the docs folder just contains a single documentation page, named index.md. The dev-server also supports auto-reloading, and will rebuild your documentation whenever anything in the configuration file, documentation directory, or theme directory changes. Open the docs/index.md document in your text editor of choice, change the initial heading to MkLorum, and save your changes. Your browser will auto-reload and you should see your updated documentation immediately. Now try editing the configuration file: mkdocs.yml. Change the site_name setting to MkLorum and save the file. Your browser should immediately reload, and you'll see your new site name take effect. Save your changes and you'll now see a navigation bar with Home and About items on the left as well as Search, Previous, and Next items on the right. Try the menu items and navigate back and forth between pages. Then click on Search. A search dialog will appear, allowing you to search for any text on any page. Notice that the search results include every occurrence of the search term on the site and links directly to the section of the page in which the search term appears. You get of all that with no effort or configuration on your part! Save your changes, and you'll see the ReadTheDocs theme being used. By default, MkDocs uses the MkDocs favicon icon. To use a different icon, create an img subdirectory in your docs_dir and copy your custom favicon.ico file to that directory. MkDocs will automatically detect and use that file as your favicon icon. Notice that your source documentation has been output as two HTML files named index.html and about/index.html. You also have various other media that's been copied into the site directory as part of the documentation theme. You even have a sitemap.xml file and mkdocs/search_index.json. If you're using source code control such as git you probably don't want to check your documentation builds into the repository. Add a line containing site/ to your .gitignore file. If you're using another source code control tool you'll want to check its documentation on how to ignore specific directories. The documentation site that you just built only uses static files so you'll be able to host it from pretty much anywhere. GitHub project pages and Amazon S3 may be good hosting options, depending upon your needs. Upload the contents of the entire site directory to wherever you're hosting your website from and you're done. For specific instructions on a number of common hosts, see the Deploying your Docs page. To get help with MkDocs, please use the discussion group, GitHub issues or the MkDocs IRC channel #mkdocs on freenode. Copyright © 2014 Tom Christie, Maintained by the MkDocs Team.